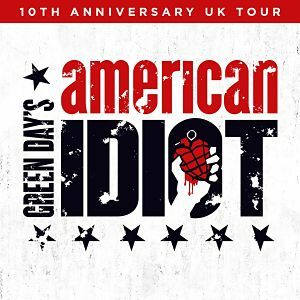 Following two critically acclaimed West End runs and a sell-out UK Tour, Green Day's rock musical American Idiot is returning to mark the show's 10th anniversary and the 15th anniversary of the Grammy Award winning original album. The new tour is being presented by Selladoor Productions producers of Flashdance, Fame, Avenue Q and Little Shop of Horrors. The special anniversary tour opens from 17th January 2019 at the Grove Theatre, Dunstable, with press night at the Mayflower Theatre, Southampton on Thursday 24th January. Tickets go on general sale this Friday, 6th April. Its hit songs include Boulevard of Broken Dreams, 21 Guns, Wake Me Up When September Ends, Holiday and the blockbuster title track American Idiot from Green Day’s 2004 Grammy Award-winning, multi-platinum album. Also included are several songs from Green Day’s 2009 release 21st Century Breakdown, and an unreleased love song, When It’s Time.